How can music help the mind and body? Ease Pain: According to one study of fibromyalgia patients done by Fr ontiers in Psychology, listening to relaxing, pleasant, self-chosen music reduced pain and increased functional mobility. Another study form the Journal of Advanced Nursing in 2005 showed that listening to music can reduce chronic pain by up to 21%. It can also make patients feel more in control of their pain and less disabled by the symptoms of their condition(s). Reduce Stress: Stress is one of the major enemies of chronic conditions like lupus. It can cause heightened disease activity and flares. According to a study from Stanford University School of Medicine, moods were uplifted and depression levels were reduced for 20 people, ages 61 to 86, who listened to familiar music they selected while practicing various stress-reduction techniques on their own or with the help of a music therapist. At the same time, the control group who did not use the music and the stress reduction techniques saw no measurable improvement during the 8 week study period. Lessen Depression/Boost Mood: A recent study by Stanford University shows that depressed patients gain self-esteem and their moods improve after music therapy. Another study published in Nature Neuroscience found that listening to classical music triggers the brain to release dopamine, a ‘feel good’ chemical which has effects on emotion and can make you feel happier! Reduce Anxiety: In one study reviewed by Daniel Levitin, a prominent psychologist who studies the neuroscience of music at McGill University in Montreal, researchers studied patients who were about to undergo surgery. Participants were randomly assigned to either listen to music or take anti-anxiety drugs. Scientists tracked patient’s ratings of their own anxiety, as well as the levels of the stress hormone cortisol. The results: The patients who listened to music had less anxiety and lower cortisol (a steroid hormone) than people who took the medications. Levitin does acknowledge that this is only one study, and more research needs to be done to confirm the results, but it points toward a powerful medicinal use for music. Reduce the need for sedatives and pain relievers during and after surgery: One June 2008 study from the Medscape Journal of Medicine showed that listening to music proved to be just as effective as sedatives in relieving the anxiety of 207 different patients before an operation. The researchers found no significant differences in heart rate, blood pressure, cortisol level, and anxiety between those taking diazepam and those who listened to music during the preparations for surgery. Help shorten hospital stays: One study found that surgery patients who listened to comforting music recovered more quickly, felt less pain and were released earlier from hospital stays than those who did not. The International Journal of Arts Medicine reports that infants in intensive care go home three days earlier eat better and gain more weight if the staff talks and sings to them. 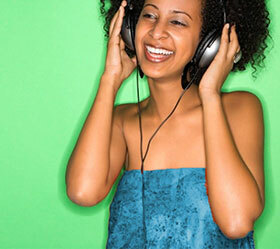 Lower Blood Pressure: Some studies show that soothing music can lower blood pressure by up to 5 points. Enhance concentration and focus: The research team at the Stanford University School of Medicine designed a study to measure how the brain sorts out different events, but what they ended up finding was a concrete physiological link between listening to music and learning. The research group found that music ‘lights up’ areas of the brain involved with making predictions, paying attention and committing details to memory. Improve Sleep: In 2005, Professor Good and Hui-Ling Lai published a study in the Journal of Advanced Nursing showing that listening to 45 minutes of soft music before bedtime can improve sleep by more than 1/3. According to another study done by researchers at the University of Louisville School of Nursing, in Louisville, Kentucky, 24 out of 25 people with sleeping problems nodded off more quickly, snoozed for longer periods of time or got back to sleep more easily after a middle-of-the-night awakening after listening to Classical and New-age music. Practicing good sleep habits also play an important role. What is the best way to use music for better health? You can design your own musical “prescription” based on your desired results. For mood boosting, choose upbeat, inspirational, energetic music like what is on our Out of the Shadows…album. If sleep is your goal, choose quieter, slower, melodic music like New-age or Classical. For stress reduction choose any music that frees your mind and distracts your attention from your worries. This is a purely personal choice. It could be anything from Ella Fitzgerald to Beethoven or even Bruce Springsteen! For pain relief, try gentle and soothing musical selections that steady your pulse and promote relaxation. Martha Burke MT-BC (Music Therapy, Board-Certified), director of the Center for Music Therapy Research in Greenville, NC suggests that breaking the pain cycle can be done by sending your body signals to relax, and by occupying and distracting your mind. This can help to alter your perception of pain. I think we have adequately shown and research has proven that there are indeed physiological benefits of music. In my humble opinion, the very best part of taking advantage of music’s healing power is that it costs nothing to try at home and no prescription is needed! This is not to advise you to cast off your physicians and prescribed medications. Please don’t do that. But to imagine that your existing music library might just hold some keys to improving your mood, lessening your stress levels, helping you sleep better, or perhaps even reducing your pain and discomfort is an inspiring idea, is it not? I think we can all agree that at the very least, music can boost your mood, is less expensive than medications and most likely will not have any negative side-effects. So maybe it’ worth a try. If you would like some VERY uplifting and inspirational songs to start your medical musical odyssey, then look no further.